* FSU Dean’s List (Spring 2014). * Appeared in seven games on the season and recorded over 110 minutes in goal as the Seminoles advanced to the College Cup for the fifth season in a row. 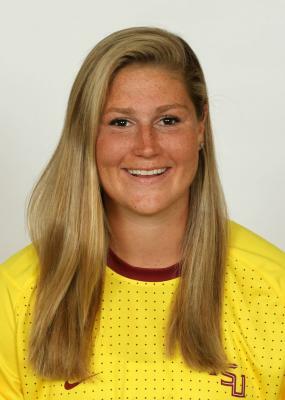 * Did not allow a goal in any match and was part of seven of FSU’s 15 shutouts on the year. * Combined to make three saves on the season. * Played a season-high 28 minutes against Southeastern Louisiana on August 28. * Saw action against No. 21 Texas A&M, as well as Pitt, South Alabama and UCF which were receiving votes in the national poll. * Helped Florida State set NCAA tournament records with 10 consecutive shutouts and a consecutive scoreless streak of 931:47. * Redshirted the 2014 season. * Named Defensive MVP at Chiles in 2010 & 2011. * Garnered All-Big Bend first team honors in 2010 & 2011. * Ranked No. 26 nationally by TopDrawerSoccer.com coming out of high school and the No. 3 goalkeeper. * Member of National Honor Society, Key Club and PALS Club. * Earned High Honor Roll honors all four years at Chile HS. * Played club soccer for Eclipse Select. * Member of the FL ODP (2009-12) and Region III ODP (2009-11) teams. * Participated in the Id2 Camp in 2010. * Illinois State Cup Champions in 2011. * Region II Champion in 2011. * Runner-up National Champion in 2011 and 2014 with Eclipse Select. * Part of the Region III ODP squad that went to Costa Rica in 2010. * Went to U.S. U-20 National Camp and National Goalkeeper Camp in 2015. * Participated in the U.S. U-14 National Camp in 2010. * U.S. U-15 National Team Camp in 2011. * Daughter of Cathy and Lantry Brockmeier. * Dad played baseball at Appalachian State, cousin played baseball at UF. * Arrived on campus in January 2014 enrolling at FSU for spring semester.